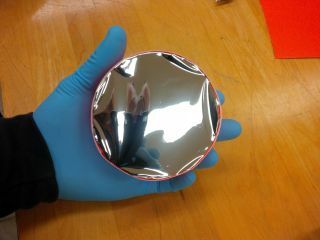 A solar filter made from solar film for an 80mm telescope. This Expert Voices column is from Bob Baer, who directs the public astronomy observations and general physics outreach events in the physics department at Southern Illinois University (SIU) Carbondale He has been leading SIU's eclipse-outreach efforts for three years, in anticipation of the 2017 total solar eclipse that will cross the U.S. from coast to coast on Aug. 21. With less than two weeks to go until the Aug. 21 total solar eclipse, you should either have a plan in place for where you will view this celestial event, or rapidly be making a plan. Skywatchers observe the sun with solar-viewing glasses and card viewers. The partial eclipse phase of the March 9, 2016, total solar eclipse, seen from Tanjung Pandan, Indonesia, with clouds visible in front of the sun. If you will be taking additional equipment — such as telescopes, binoculars or cameras — to the eclipse, take inventory of what you want to use and decide what you want a solar filter for. You'll need a filter for each device you want to use to observe, photograph or film the partial phases of the eclipse. You do NOT want to take large scopes to an eclipse-viewing event as a first-time eclipse viewer. Think compact, personal and easy to use when selecting a telescope. The images here were taken with a compact, 80mm scope, which provides plenty of aperture to get decent views of the eclipse and capture decent images. The "diamond ring" phase of the March 9, 2016, total solar eclipse, seen from Tanjung Pandan, Indonesia. If you need solar filters for your equipment, the most economical and perhaps simplest thing to do is to buy a sheet or two of a common solar safety film. Be sure to get the type of film that is rated for visual use. Two manufacturers of good quality visual solar film are Baader Planetarium and Thousand Oaks Optical. A color-neutral film like the Baader AstroSolar safety film will provide images of the sun with no color correction. Filters like this always go on the front of the scope before any optics (lenses or mirrors). If the telescope you intend to observe with has a finder scope, I recommend removing it prior to solar viewing; this will keep you from accidentally looking through an unfiltered finder scope. Sheets of solar safety film typically come with instructions you should follow. If you're not sure what you're doing or if this is the first filter you've made, seek assistance from someone with experience. Get extra film, make a filter and test it out. Once your filter is finished, you may test it by holding it in front of your eyes and viewing the sun or an intense light. The image of the sun you see should look similar in brightness to what you see though eclipse glasses. If you see an image of the sun that is uncomfortably bright, or see a bright point of light anywhere in the filter, it can be an indication that you have a pinhole or other damage to the film. Do not use a questionable filter. It's possible to buy add-on solar filters for some telescopes. The Celestron EclipSmart solar filter can fit on some Celestron PowerSeeker telescopes. Explore Scientific's "Sun Catcher" variable large-aperture solar filters are available in many sizes. It is relatively easy to make your own filter with some poster-board material, filter sheets, and a little glue and tape. In a pinch, you can even cut out a piece of filter material and connect it to a lens with a rubber band. One nice thing about the filter film is you can easily travel with all the materials required to make filters on site once you get to your eclipse location. That way, you won't damage the filters in transit. When working with the film, it is best to wear gloves so that you don't get fingerprints on the film or otherwise damage it. If you do damage the film, toss it and use a new piece. The film is really cheap compared to the cost of damaging your equipment or eyes. With filter in hand, you are ready to make your own images and see the sun in white light. The sun, seen through an in H-alpha filter on the Lunt SUNlab. Now, back to that plan you should be making about where to see the eclipse. First-time eclipse viewers should seriously consider going to an eclipse event. At an event, such as the one is taking place at my university, SIU Carbondale, you will be able to meet others with similar interests, take part in a variety of quality events and of course see the eclipse. At many eclipse events, you will also likely find solar telescopes set up by experienced observers, so you can get a detailed look at the sun during the partial phase. One of the unique things that will be in place at SIU Carbondale is the Lunt SUNlab, a mobile solar-observation lab that captures high-resolution images of the sun in multiple wavelengths. The images will be seen throughout events on campus as well as streamed through the NASA EDGE Eclipse 2017 MegaCast live from SIU Carbondale. The image above is a SUNlab test image; to see more images, check out Steven Pizzo's Instagram feed. Once you see the imagery that this lab can produce, you'll likely understand why you should leave the heavy equipment at home and just enjoy the eclipse and imagery being produced for you. Bob Baer is a member of the Astronomical Association of Southern Illinois and is a co-investigator for the Citizen CATE (Continental America Telescopic Eclipse) Experiment. He is co-chair of the Southern Illinois Eclipse 2017-2024 steering committee and is coordinating science and outreach partnerships for the SIU Carbondale eclipse events.